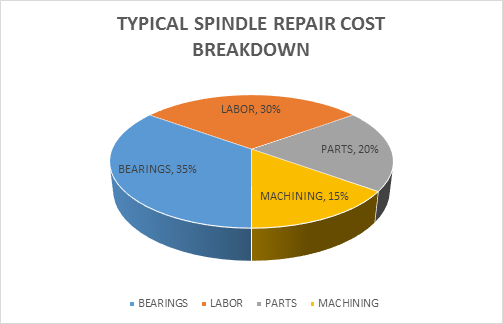 Spindle Repair Cost - What Factors Impact Price? How much does it cost to repair a damaged or worn spindle? 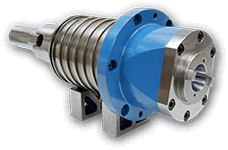 On average, the cost to repair a spindle runs between 25% and 30% of the cost of a new spindle. With our database of more than 100,000 previous repairs, we are able to provide a good estimate prior to examination. All we need to know is your spindle make and model. When providing the initial estimate, we often include the lowest price and the highest price so you can see the range of cost. Once we perform an in-depth examination of your damaged spindle, we’ll provide a comprehensive evaluation report detailing exactly what we found, what we’ll repair, and a firm quote using top name-brand super-precision bearings and parts. There is no charge or obligation for the evaluation. We’ll begin repair work immediately after we receive your approval on the quote. Our reputation for providing accurate estimates is one of the reasons we’ve been in business for more than 30 years. To get your estimate, just fill out the form or call 1-603-438-0333 Monday – Friday 7 a.m.-4:30 p.m. ET. There are many factors that can significantly impact the cost of the repair. For instance, a damaged tool interface may add between $700 and $1,600 depending on the size and style. Damaged bearing journals can add between $400 and $1,400. A damaged shaft can add $4,000, often doubling the cost of a base repair. These things may require an examination to determine if they are damaged. Besides surface restoration (GPG) and shaft replacement, there are many other factors that can drive up the cost to repair a spindle. If you have any questions, give us a call at 1-603-483-0333. A real person will answer the phone Monday – Friday 7 a.m.-4:30 p.m. ET.